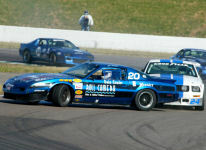 94 Mustang originally built by Andy Mcdermid, featured in The Summit Racing contingency pay form. Felice engine. Auto Gear Co custom transmission M23. Penske T&A double adjustable rear shocks. Koni front shocks. Detroit Locker multiple gear sets. GT 40 Brembo front brakes, Trick rear suspension no wheel hop here. 8 17 inch wheels with used tires,12 16 inch wheels with 4 mounted rain tires. All kinds of Spares available engine, transmissions body parts Etc. Retiring from racing. All offers considered. Contact John Lechner at lechner80@sbcglobal.net. Thanks if you leave me your phone number I'll call you back. This is a nice car. Not as nice as Mine , but a great deal for someone.